A bluefin tuna fetched a record 32.49m yen (£254,000) today at the first auction of the year at Tsukiji market in Tokyo, but the fish’s growing popularity across Asia has raised fears it will soon be fished into commercial extinction. The 342kg tuna easily beat the previous record, set exactly 10 years ago when a 202kg fish fetched 20.2m yen. The tuna auctioned was caught using the longline method off the coast of Toi in Hokkaido, Japan’s northernmost prefecture. Market officials are accustomed to seeing prices rise during the new year auction at Tsukiji, the world’s biggest fish market, but today’s winning bid was unexpected. 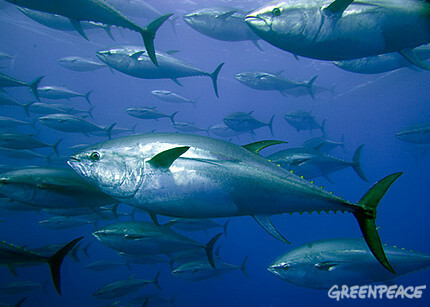 In a report released last year, the WWF warned that if fishing continued at current rates, the Atlantic bluefin would be “functionally extinct” in three years. Read more.